Feel like royalty in an ocean paradise when you voyage to Tahitian Princess, a spectacular resort rental condominium complex in North Myrtle Beach, South Carolina. Graced by South Carolina palmettos and lush landscaping, this beach vacation destination is stunning inside and out. 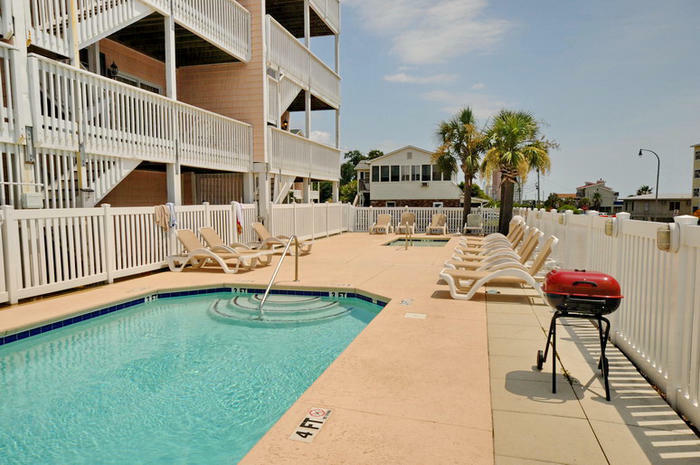 Located in the Windy Hill area of North Myrtle Beach and just steps from the wide sandy beaches, Tahitian Princess exudes luxury throughout its three stories. It is the perfect beach vacation getaway! This aesthetic resort features luxury condos brimming with gorgeous furnishings and decor, as well as all the comforts of home. With thousands of square feet to explore, you will constantly discover new things to love about your vacation rental resort. Let your worries slide away, knowing you are miles away from the stresses of ordinary life. Glimmering blue pools, hot tubs, and ocean views collide for moments of bliss. The Tahitian Princess is the ideal balance of comfort and paradise. Each luxury condo is fitted with beautiful and well-equipped kitchens and opulent balconies with regal views of the Atlantic Ocean. With game rooms and balconies and Jacuzzi bathtubs in each luxury condo, and with indoor and outdoor pools and hot tubs at the resort, there is plenty to keep you relaxed and entertained at the Tahitian Princess. Linger poolside with some light reading, or take a jaunt across the way for some beach therapy, allowing the warm sand and ocean waves to sing to your soul. Your North Myrtle Beach, South Carolina, vacation rental condo is located near a plenitude of attractions, shopping, restaurants, and wildlife encounters. The golfers in your group will be mesmerized by over 100 courses to green their days. Art enthusiasts will be pleased at the numerous music and artistic venues available in the area, including eclectic art galleries and live music and theatre. Those seeking adrenaline rushes will not be disappointed with the North Myrtle Beach selection of parasailing, jet skiing, and skydiving, just to name a few! Incredibly, over 1,000 restaurants and eateries in the area await to cater to even the most selective palates. Literally just steps from the Tahitian Princess resort is the Springmaid Beach Pier, a long pier where you can fish or walk about, enjoying the fabulous views and the sound of the crashing ocean waves. Also not so far away is Myrtle Beach State Park, a great place to go fishing, birding, and to enjoy the natural beauty of South Carolina. Throughout all of your North Myrtle Beach adventures, the majestic Tahitian Princess will treat you like nobility! Elliott Beach Rentals is not affiliated with onsite management or the HOA of Tahitian Princess.